Dr Jerome Anekwe is the founder and senior pastor of Destiny Christian Centre in Acton, London. He's participating in various social medias for preaching the Word of God, sharing the love of God and teaching the principles of the Kingdom. 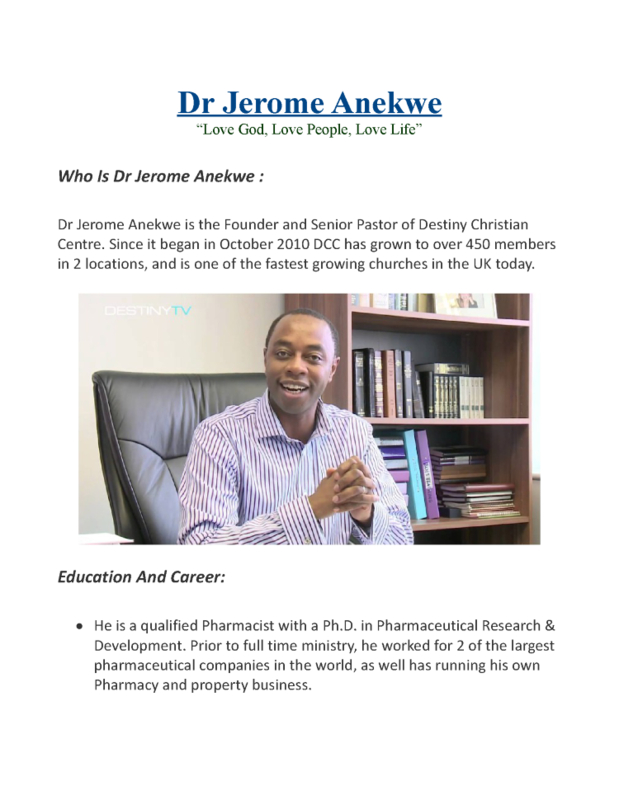 Dr Jerome Anekwe “Love God Love People Love Life” Who Is Dr Jerome Anekwe : Dr Jerome Anekwe is the Founder and Senior Pastor of Destiny Christian Centre. Since it began in October 2010 DCC has grown to over 450 members in 2 locations and is one of the fastest growing churches in the UK today. Education And Career:  He is a qualified Pharmacist with a Ph.D. in Pharmaceutical Research Development. Prior to full time ministry he worked for 2 of the largest pharmaceutical companies in the world as well has running his own Pharmacy and property business.  He is a conference host and seasoned TV broadcaster. He is a sought after international speaker who has been privileged by God to minister in meetings with over 100000 people in attendance. He has also featured on radio BBC Yorkshire Premier Gospel and published numerous articles in mainstream Christian magazines. 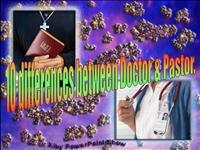  Dr Anekwe teaches with a powerful prophetic anointing with the father heart of God. He is committed to preaching the Word of God sharing the love of God and teaching the principles of the Kingdom. It is these qualities that has made him a father to many and a mentor to many other Pastors.  Dr Anekwe also carries a strong healing anointing having been personally touched by Jesus and miraculously healed from a disease doctors said was incurable. Along with his wife Ruth their ministry is characterized by remarkable testimonies of people being healed from cancers and many chronic diseases as well as women bearing children after many years of infertility. Family: Dr Anekwe is married to Ruth with whom he co-pastors and is the father of 4 wonderful young boys – Luke Asher Curtis James Jaron Thomas and Daniel Carter. They have a heartfelt desire to see every person find fulfilment joy and purpose by walking in their God-given destiny. They are passionately committed to envisioning empowering and equipping God’s people to be all that He called them to be experiencing the love of God and radiating His goodness It was with this mandate in mind that Destiny Christian Centre was born a place where people can genuinely love God love people and love life.